Discussion in 'Shop Talk - BladeSmith Questions and Answers' started by rprocter, Jul 5, 2009. I am not a knifemaker so i hope using this forum to ask a question is o.k. i recently bought a Bird & Trout knife by Charles Weiss from a BF member. the steel is dendritic 440C and the blade is etched "Cast Steel". i assume the maker used the stock removal method on a bar of this steel. surely he did not melt down a bar of 440C and then cast it into a blade shaped mold ? i.e. the dendritic steel is purchased as such in a bar ? so why is it called "cast" ? surely all steel is cast into bars(etc) at the steel foundry ? this knife was made some years ago. i have not seen any currently made knives with this steel. did it proove to be not really superior to regular 440C ? or has it been eclipsed by newer steels like S30V, ATS-34, etc ? are there any downsides to this dendritic steel ? David Boye came up with the procedure to cast steel and have it grow a dendritic carbide structure. He did this for several reasons, one of them being his artistic use of the steel for engraving and etching. He claimed that the steel was far better for a knife blade,too. According to him ( and the people who use his proprietary steel blade blanks) the edge is micro-serrated with the carbide dendrites, making it far longer lasting and superior in cutting. That was 25 or so years ago, and as far as I know he is the main person still doing it (I I can't say with surety, but I believe the other makers offering the same thing purchase the blanks from David Boye, who contracts with some foundry to make the blades.). The knives are cast in the lost wax process, and a nearly finished knife is the product. It just needs to be smoothed out and finished ( which is not quite as simple as it sounds). He does cast bars of his dendritic cobalt, as well as knife blanks ( and maybe bars of dendritic D-2 and 440-C). The knife supply catalogs sell David's blade blanks. I have finished several of David's cast dendritic blades, and made a bunch of dendritic cobalt blades by stock reduction from bars. I have not found any magical properties to the edges.The finished knives were good, but I'm not sure they were better. The cost of the blade blanks and bars is quite high, and that is probably the biggest reason the process isn't an industry wide success. Thank You Stacy. this is a surprise: "The knives are cast in the lost wax process, and a nearly finished knife is the product. It just needs to be smoothed out and finished"
so most likely Charles Weiss bought the blade already cast from Mr. Boye and then did the finishing. so not exactly sole authorship, but a good looking knife. I just picked up a few items from a local guy who used to be a maker and has not been making the past several years. On top of the box of stuff I got off him he threw in a bar of the cast 440c from Boye along with all the paperwork associated with. As Burton pointed out, the knife could have been ground from a bar of cast steel, which makes it sole authorship. Some buy and finish the blanks, and some grind the whole blade. Asking the maker should answer the question of which he does. Looking at the bolster, I would assume the maker used a casting. I also may be unfamiliar with others than Boye who cast dendritic steel, but it is not a home process, and requires a lot of foundry equipment. According to the Gun Digest book of knives 1997. Charles Weiss machines his own molds to make the wax blanks, he then sends them to a foundry where the lost wax casting process is done. Then Mr. Weiss finishes the blades out. Since he makes the molds and wax blanks the only outside work is the casting. I would say this is sole authorship. If I remember right, I think Boye's blank castings tended to be stick tang integrals. The fact that it was cast is clear. 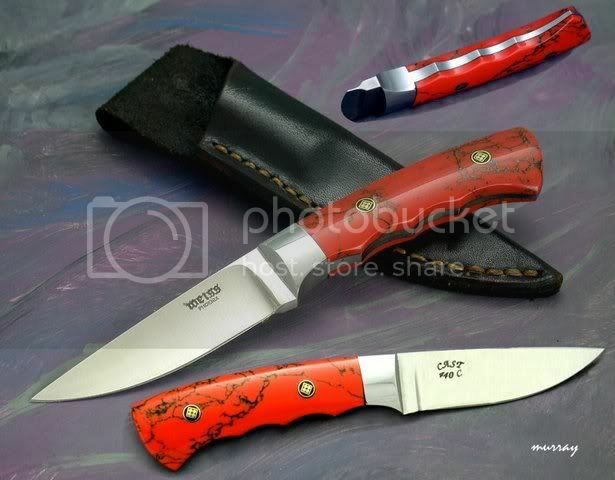 It is nice to know that the maker makes his own patterns.The knife is a nice piece, and I am sure is worth a good bit. For those who are not familiar with the process of lost wax casting, you make an original pattern piece ( in either wax or some other material) and from that you make a mold to reproduce the wax patterns. These molds are usually made in some sort of rubber compound. Wax is poured/injected into the mold, and removed. You can make thousands of identical copies this way. The wax models are then invested in a plaster like material called cristobalite, which hardens. This is then placed in a burnout oven to melt the wax and burn off the carbon residue. The resulting mold is a perfect negative replica of the wax. Molten metal is cast into this mold by centrifugal force, vacuum /air pressure, steam, or several other ways. Once the metal had cooled and is ready to be removed, the mold is destroyed ( usually by being put into water while still hot) and the metal items are pickled in an acid to clean them and remove the traces of investment. Depending on the usage of the cast parts, they are either tumbled to a bright finish, or hand finished ( as would be a knife blank). This process allows repetition of the same knife with out any variation . i agree with stacy had a couple boyes and a d2 dendritic for got d2 makers name.cardboard cutting tests;on all 3 blades gave unimpresive results. Quote Stacy: " Looking at the bolster, I would assume the maker used a casting." and Quote Craig: "I think Boye's blank castings tended to be stick tang integrals." so if i understand this correctly, the tang, bolster and blade are cast as one piece; and the size of the bolster being much thicker than the blade means that it has not been ground from a bar of cast steel. and this is more or less confirmed by the Gun Digest article quoted by JBS. until i became interested in this knife, i had not heard of lost wax casting and had no idea that knife blades could be made in this manner. it is more complex than either stock removal or forging even though i assume it does not require a final heat treatment for correct tempering as this would alter the dendrites and negate the whole point of the method. as D.S. points out: "gave unimpresive results", it is not surprising that this method is either no longer used, or if used, only by the very occasional maker. a sincere thanks to all who have helped here. i really like to understand as much as i can about the nature of the work that the maker puts in to every custom knife i have. for this one, i did first try a BF and internet search, but was unable to put the info together in the understandable way as you all have done for me here. it is a beautiful looking knife. when it arrives i will have to decide if i will try it out or leave it as a mint example of this maker's work. If you're curious about what some of the original Boye castings looked like, you can see a page of them in the Sheffield online catalog. There were a few others and they are (were) definitely raw castings except Boye would true up the face where the handle would seat against the integral bolster. I knew there were pics still around somewhere, and I think the 440c stuff was from around the early to mid nineties. i emailed Mr. Weiss and received this reply: "Lost wax CW"
On page 272 of the Boye book shows David cutting a 1 inch hemp rope 3000 times with his BDS blade before sharpening. This may be a classic example of how knife performance is an entirely subjective thing, and often nowhere near as extreme as we would like to believe. For what it is worth virtually every other application when steel is cast, great lengths gone to in order to eliminate dendritic structure as much as possible due to the catastrophic affect it has on overall strength from large scale such as impact and flexing, to the micro scale such as very thin sections handling pressure and wear. And yet there are those people out there who are very pleased if not thoroughly impressed with the performance of an entirely dendritic blade. Ah yes, the clockwise lost wax casting process. Duh ? i thought it was clockunwise; i.e. slow, many steps, takes much time. could you please elaborate Mr. Amazing Precise Machinist ? Nathan, this is important , if they are centrifically cast the mold should be spun clockwise to get the best quality. At or near the full moon will also insure better quality ! Sorry. I'm a materials and processes nerd and could not figure out what "lost wax CW" was... I'm a little slow on the uptake.